2. Provide some background information about Ashdod (I Sam. 5:1). And the Philistines took the ark of God, and brought it from Eben-ezer unto Ashdod. A. Ashdod was a city in Palestine that was in the territory of Judah (Josh. 15:47), but it never came into their possession. It was occupied by the Anakim (Jos. 11:22). C. It is located between Joppa and Gaza and was 3 miles from the Mediterranean Sea. D. It was one of five lordships of the Philistines. 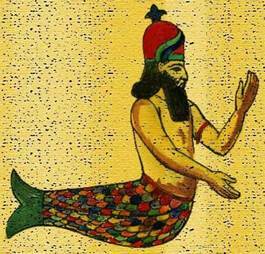 A. Dagon was the “fish god” of the Philistines. B. It was the deity of fertility. C. It had the head and hands of a man and the tail of a fish. 4. What happened to Dagon the first night the ark was put in his house? (I Sam. 5:3). And when they of Ashdod arose early on the morrow, behold, Dagon was fallen upon his face to the earth before the ark of the Lord: And they took Dagon, and set him in his place. A. He had fallen to the ground and was prostrate before the ark of God. B. When enemies captured significant things of their opponents, they would often put them in the temples of their gods. 2. As proof that their god was more powerful than the “god” they had conquered. 3. To insult the people who had just been defeated. C. Dagon’s position is that of homage and submission to the God of Israel. “…the Philistines were to learn, that even their supreme deity had been obliged to fall down before the majesty of Jehovah, the God of the Israelites” (K&D, e-sword). 5. What happened the second night the ark was in the house of Dagon? (I Sam. 5:4). A. Dagon fell on his face to the ground before the ark, and, the head of Dagon and both his palms were cut off. 1. The removal of the head was a death blow to the image. 2. The cutting off of the hands indicates that his power and might had been removed. D. ‘…these proofs of God’s power and authority prepared the way for his judgments” (Clarke, e-sword). 6. Where were the head and palms of the hands of Dagon put in Dagon’s temple? (I Sam. 5:4). A. They were placed upon the threshold. B. The fact that the head and palms were on the threshold indicates that they could be tread upon by those who entered and left the temple of Dagon. 7. T – F The priests of Dagon will not tread on the threshingfloor of Dagon. (I Sam. 5:5). B. These idol worshippers believed that the place where their god was found is holy. With his hands and head at the threshold, they made that place holy and would not tread upon it. 8. The description of God’s judgment is noted in three ways in I Samuel 5:6. List the three ways it is described. But the hand of the Lord was heavy upon them of Ashdod, and he destroyed them, and smote them with emrods, even Ashdod and the coasts thereof. C. The Lord did not limit the destruction to the god Dagon. He also brought harm to the worshipper of this false god as well. 1. It was something that God threatened to bring up Israel if they disobeyed (Deut. 28:17). 2. It had to do with the hinder parts (Ps. 78:66). And when the men of Ashdod saw that is saw so, they said, The ark of the God of Israel shall not abide with us: for his hand is sore upon us, and upon Dagon our God. A. They asserted that the ark could not remain in their city. B. They knew that the hand of God was upon them and their god. C. When God inflicts punishment upon His enemies, it can be swift and extremely harsh. 1. These were a portion of the nations that God left in Canaan to test Israel (Judg. 3:1-3). 2. These five men were rulers, or, war lords. Other languages refer to them as tyrants and satraps. 3. 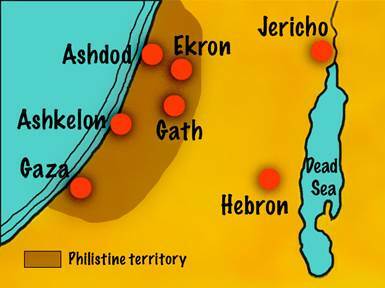 Each was assigned to their city in Philistia: Ashdod, Ashkelon, Ekron, Gath, and Gaza. …And they answered, Let the ark of the God of Israel be carried about unto Gath. And they carried the ark of the God of Israel about thither. A. Ashdod was the most northern lordship, and Gaza as the most southern. B. The lords do not want to give up their victory. Perhaps they were hoping that taking it away from the city of the temple of Dagon would cause the afflictions against them to cease. A. God smote them with a very great destruction. B. The word “very” means “vehemently.” Great indicates great in any sense. Destruction involves tumult, confusion, uproar, trouble, disturbance, and vexation. …and he smote the men of the city, both small and great and they had emrods in their secret parts. A. In their secret parts. B. These parts are extremely sensitive and tender. Therefore they sent the ark of God to Ekron. A. This is another lordship of the Philistines. B. It is another move northward and more into the interior of the nation. And it came to pass, as the ark of God came to Ekron, that the Ekronites cried out, saying, They have brought about the ark of the God of Israel to us, to slay us and our people. A. They have brought the ark of the God of Israel to us, to slay us and our people. B. We are not told exactly how long the ark resided in each city. But, the devastation that came upon those cities was reported far and wide among the Philistines. A. The decision was made to return to the ark of God to Israel. B. Just the decision itself did not cause the hand of God to be removed from them. D. “…we may see very clearly that Ekron was visited even more severely than Ashdod and Gath. This was naturally the case. The longer the Philistines resisted and refused to recognize the chastening hand of the living God in the plagues inflicted upon them, the more severely would they necessarily be punished, that they might be brought at last to see that the God of Israel, whose sanctuary they still wanted to keep as a trophy of their victory over that nation, was the omnipotent God, who was able to destroy His foes” (K&D, e-sword). B. We do not know if they were crying out to Jehovah or to their own gods. C. When men are afflicted and can no longer help themselves, they always turn to a higher being to save them. 12. T – F They were warned not to harden their hearts. (I Sam. 6:6).